“My job required me to travel the globe and it was then that I discovered the world is a big, interesting place,” says Toronto native Jim Pierson of his past life as an engineer. In the mid-90s, a chance encounter on a commuter flight from Chicago to Toronto brought Jim and his wife Helen together. At the time she was working as Director of Client Services in Toronto.After they married they moved to the U.S. but after the events of 9/11, they decided they wanted to live elsewhere. One day Jim and Helen looked at each other and asked, “So where should we go next?” They began exploring their options overseas. They visited Malta and Croatia but soon realized that Europe was a bit too far away from Canada for them. Next they explored Mexico and several other Caribbean locations closer to home. “As we were getting older, we decided we wanted to live in a warm climate where we could make some investments, to make our assets last for the rest of our lifetimes,” Jim says. Coincidentally, the longitude line that runs through Niagara Falls in Canada goes directly through Panama City, Panama. “We could fly just five hours due south to Panama,” Jim explains. “Panama enticed us with its warm climate, same time zone as Canada, good infrastructure, plus it uses the U.S. dollar which we’d become comfortable with. They fell in love with the laidback beach lifestyle of Coronado, just 50 miles west of Panama City. Coronado is complete with all of life’s necessities. There are four major grocery stores, a large department store, restaurants, clinics, fast food outlets, and more. And just 40 minutes down the Pan-American Highway is a movie theater and several mega-malls for more retail and entertainment. 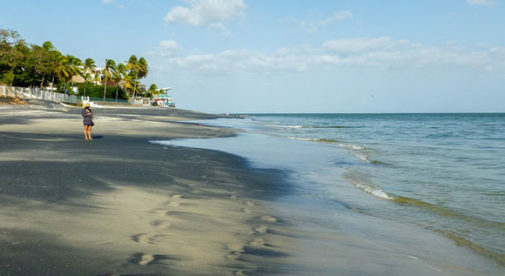 There’s also the glittering black-sand beach, which is quiet and peaceful…no huge resorts lining the shoreline. They bought a beachfront condo where Jim still works for his own consulting business part time. When he’s not working Jim enjoys taking long walks on the beach to keep his body active, while his consulting work engages his mind. Helen keeps busy by helping out at local orphanages and hospitals. She makes regular visits to local hospitals offering up plenty of donated and handmade items. “Giving back to the community has taken on a whole new dimension in my life,” she says with a smile.